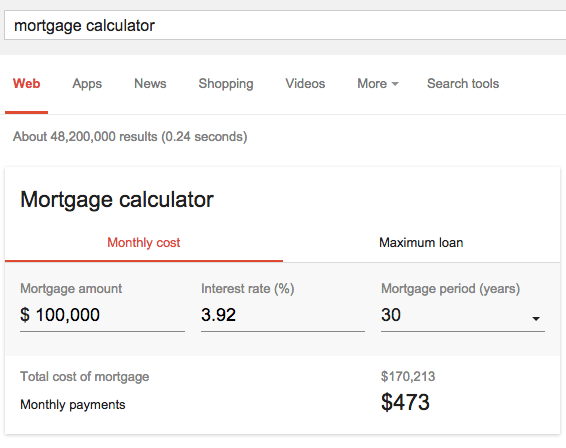 Home > Google News > Google SEO > Google Launches A Mortgage Calculator, Take That Publishers! 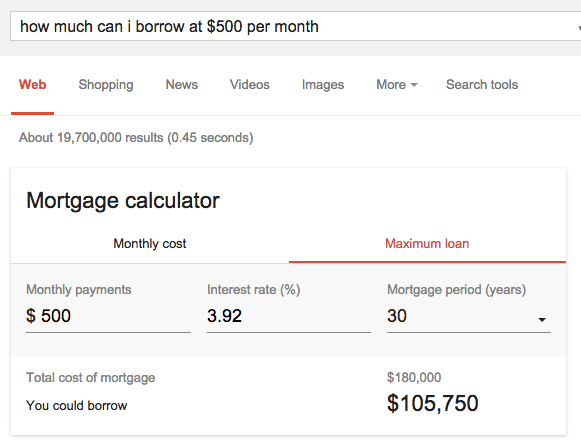 Google Launches A Mortgage Calculator, Take That Publishers! Truth is, we knew this was coming, they were testing a mortgage calculator for a few months now but yesterday, it went live to all. Google officially confirmed it on Google+ saying, "today you can ask Google things like [How much can I borrow at $200 a month?] or [at 5% APR how much can I borrow over 10 years?]" This query is huge, a huge, keyword phrase for folks in this niche. Google, just like that, took it away from them with a quick answer. This goes back to the swiss army knife analogy and how Google rationalizes taking the traffic from their source of data. But let's also quote a former Googler. On Google+ Kaspar Szymanski, who worked at Google for years in search quality, said "anyone interested in the future of the SEO industry, have a look." Yes, that is him implying that Google is swallowing them up.